I'd say that releasing an MMO-themed expansion in the aftermath of Warlords of Draenor's release made sense. But this is Goat Simulator, so none of it really makes sense. Later this week, patch 1.2 will go live for the... er... what genre is Goat Simulator, anyway? Goat-'em-up? 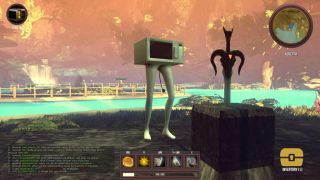 It adds a fantasy-themed RPG-like world that comes complete with quests and classes, such as Warrior, Rogue, Magician and Microwave. The Goat MMO Simulator update is released, for free, on 20 November.